We know what you’re thinking. Man buns are bad. Terrible. A hairstyle crime that carries a minimum sentence of five years’ ridicule. We can’t blame you, especially when they’re co-opted by footballers who wield about as much taste as Liberace in Poundland (hey, Andy Carroll). Don’t let naff Premier Leaguers and your local insufferable barista necessarily put you off, though. Other famous faces have proved it can be done if you follow the rules. David Beckham brought his back recently, before he chopped his hair off again. Jon Snow had one for a bit in Game of Thrones, too. It can even look sort of, *gulp*, good. Yes, the man bun will always be a hard sell, and the margin for error is colossal. But get it right, and you can untangle the trickiest men’s hairstyle in the book. Let’s get the definitions out of the way. For men with long hair, a man bun is a style that features a ponytail or bunch of hair, bundled together somewhere on the crown. When the bun is placed high on the head, it’s usually referred to as a topknot. There are different styles of man bun, some less acceptable than others. A shaggy ‘full bun’ is just long hair tied back into a loose knot, not unlike your girlfriend’s hair when she goes to the gym. You see them stacked high and low, and they’re often accompanied by facial hair (which is less common on girlfriends). Man buns also sometimes appear with an undercut, where hair is left long on top but shaved tight on the back and sides. Sometimes the contrast between top and bottom is extreme, similar to a disconnected undercut. Other times, guys keep only just enough hair on top to tie back into what most people consider a questionable rodent-like tail. The classic topknot. If you think the man bun was invented by a hipster web designer in Williamsburg in 2008, think again. It’s not a recent trend. They’ve been around for years – 2,000 years at least. If you want proof, every member of the Terracotta Army sports their own, many with elaborate topknots. Let’s not give the Chinese all the credit, though. Sail east, and man buns were also a go-to for samurai warriors in Edo-period Japan. This iteration – locally dubbed a ‘chonmage’ – kept the helmet in place, with the rest of the head shaved except for a bun of hair up-top. Sumo wrestlers adopted the style too, keen to mimic the might of the samurai, long before men who worked in organic coffee shops thought to do the same. Things did change in the late noughties, though. It was then that David Beckham first dropped his own take on the man bun, and interest climbed from there. Jared Leto grew one. So too did Chris Hemsworth. Leonardo DiCaprio gave it a try, closely followed by Orlando Bloom. 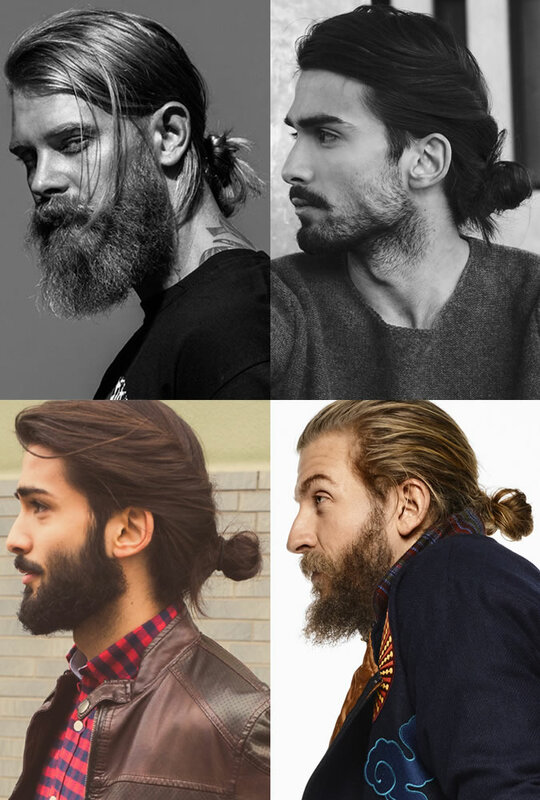 And, while the man bun has oft divided opinion, all five of these men sit firmly on the right side of style. We’ll take their word over some uptight Romans. Who Suits A Man Bun? A-listers may have sported their own, but that doesn’t grant us plebs carte blanche to grow one. 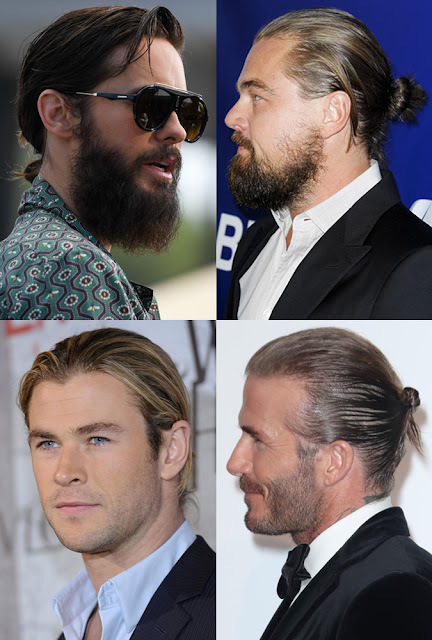 Different hairstyles suit different face shapes, and the man bun is no exception. So that means middle-of-the-road follicles are your best bet for a man bun. Anything else, and you risk a crop that’s too unruly, or just too sparse. You’ve got the face shape. You’ve got the balls. Now, you just need the actual hairstyle. A man bun cannot be achieved without length, and no, that marble-sized joke on top of your head doesn’t count. If you need to grow your hair out there are ways to speed up the process, says Stevens. “I’d recommend regular trims to keep your hair in the best condition, as healthier locks tend to grow quicker.” And while it may sound counterproductive to lose an inch in the pursuit for more, it’ll prevent any damage that could stunt your growth along the line. “Hair that isn’t cut regularly is likelier to suffer split ends,” says Stevens. “Once these set in, the hair frays, weakens and can be damaged a long way up the shaft.” The only remedy for such hairs is to be rid of them, thus delaying your quest for a man bun. The right product is equally crucial. “Since healthy hair will grow quicker, incorporate a conditioner on the ends to keep it moisturised.” Hardly rocket science, but many men overlook the importance of a conditioner to nourish your locks post-shampoo. Look out for natural ingredients, like coconut, palm or jojoba oil, that’ll moisturise the scalp without risk of irritation. Now your hair is at least shoulder length, give yourself a firm congratulations: you’ve finished the first leg in the race for an acceptable man bun. But it takes a good technique to cross the finish line. “Starting at the temple, brush the first section of hair back to the point where you want your bun to sit,” says Nat Angold, stylist at London-based barber chain Ruffians. Aim for the crown of your head: too low, and you’ll look like a Greenpeace activist, too high and you’re essentially an Essex girl. Generally speaking, the more hair you’ve got, the more attention it requires. That means you need extra product and a regular maintenance regime to stay top of the knots. Don’t think you can swerve the barbers once your hair has reached peak man bun, either. “Sideburns and nape hair should always be trimmed, especially if you’re at more formal occasion when your man bun should be slicked back with no strays.” And if you weren’t sure on the exact waiting time between visits, Angold recommends a trim every nine weeks. The go-to man bun, this style sometimes gets a bad rep but for guys with long hair, it’s a practical way of keeping flyaway strands from blinding you. It can also be styled both shaggy and smart (both low-effort), depending on what’s in your diary. More casual and less affected than overly manicured topknots, the low bun is an effortless style that brings a bit of beach-bum nonchalance to the city. Loosely pull the hair back, tie it with a band and forget about it. 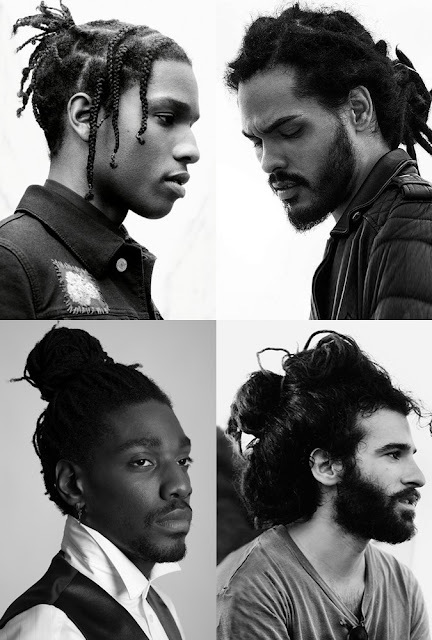 For men with afro hair, the texture itself lends itself to interesting (and arguably the coolest) man bun options. If you wear braids, take your cue from A$AP and get your barber to give you an undercut, or if your hair is long all over, consider a dramatic, reggae-inspired pile-up. 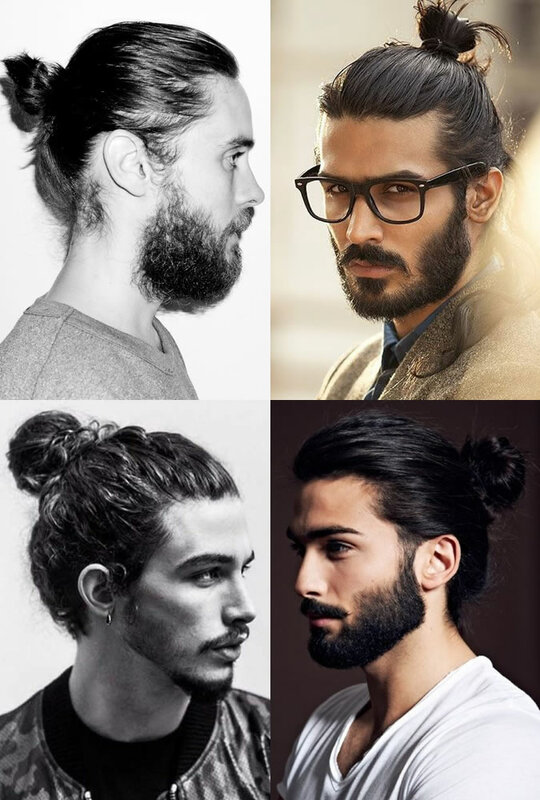 MENSTYLICA: The Man Bun Guide: What Is It & How Do You Wear It?